Shotcrete, is a concrete (occasionally a mortar) that is shot through a hose at a rapid rate onto a surface. It is reinforced by rebar, steel rods, mesh and/or fibers. There are 2 primary divisions of shotcrete. Dry mix shotcrete and wet mix. The dry mix involves placing a dry material in a hopper and then using a hose to wet the material while it is blown through the nozzle. A wet mix is the term to describe the process of pumping ready-made concrete through a hose pneumatically. The wet mix method typically leads to less waste, and the ability to place larger volumes of material in less time. 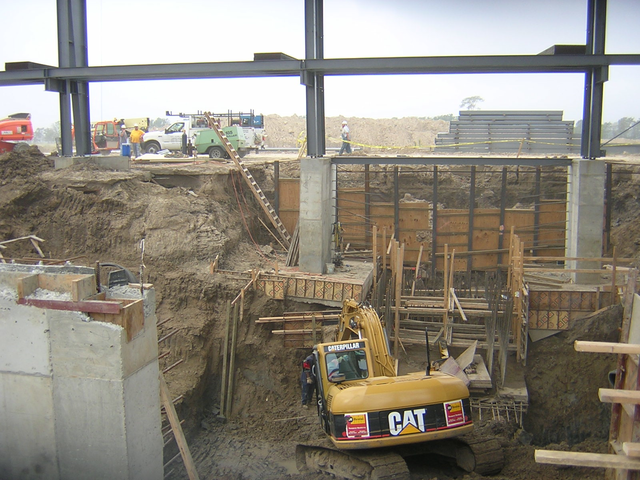 The materials used to prepare shotcrete are often the same as conventional concrete. They include; cement, lightweight aggregate, water, and admixtures. Since its advent in 1911, the process has been used successfully for a wide variety of building projects, including all types of residential and non-residential buildings. Shotcrete, which can be applied to horizontal or vertical surfaces, is especially suited for curved or thin concrete structures and shallow repairs. Other applications include swimming pools, grain silos, fire proofing structural steel, and many civil engineering structures such as bridges, tunnels, dams, tanks, and earth retention systems. Contact Alph Kaufman to schedule an evaluation or estimate. We are located in Louisville, Kentucky and service surrounding areas.